The Japanese utility model system primarily differs from the patent system in the following respects. subject to utility model protection. A utility model application is filed with a request, a description, claim(s), drawing(s) and an abstract. 2), because the subject of protection is limited to the shape of an article etc. national phase entry, whichever comes later. simultaneously with the filing of the utility model application. A utility model application must fulfill substantive requirements such as novelty and inventive steps. However, these substantive requirements are not examined. 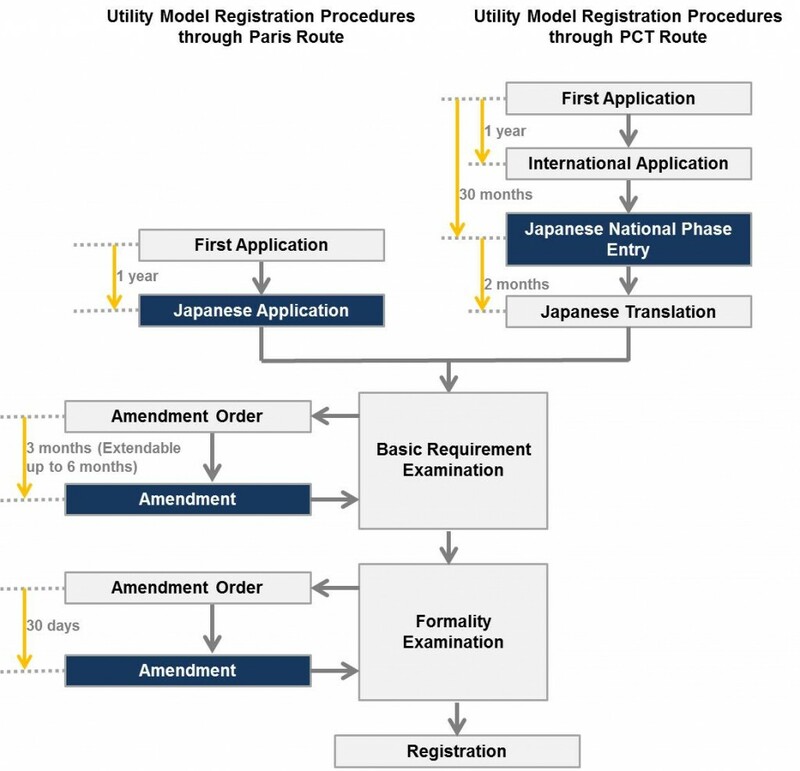 The substantive requirements for a utility model registration are the same as for a patent application. Phrases providing the inventive step in the Patent Act and Utility Model Act are slightly different. The former writes an invention which “a person ordinarily skilled in the art of the invention would have been able to easily make” lacks the inventive step (Patent Act, Article 29, Paragraph 2), while the latter writes a device which “a person ordinarily skilled in the art of the device would have been exceedingly easy to create” lacks the inventive step (Utility Model Act, Article 3, Paragraph 2). Despite these different expressions, it is not apparent whether JPO treats them differently when making a “utility model technical opinion” (See (8) below). Failure to comply with any of the substantive requirements gives a ground for later invalidation (Article 37). Voluntary amendment can be filed only for one month from the filing date (Article 2-2 and Cabinet Order on Utility Model, Article 1). Moreover, an amendment can be filed in response to an amendment order during a period specified by the Commissioner (Utility Model Act, Article 6-2). After basic requirements and formality are examined, without substantive examination, the utility model registration is granted and the official gazette is published. It typically takes about 4 months from a utility model application to the registration. compared to 20 years for a patent. Since a utility model is registered without substantive examination, there is a provision to avoid abuse of right. The holder of a utility model right should give warning to the infringer, presenting the “utility model technical opinion” issued by JPO (Article 29-2). The technical opinion is a report on the registrability of the utility model, which gives the JPO’s opinion about if the utility model fulfills substantive requirements or not (Article 12). Any person may make, to the Commissioner of the JPO, a request for a technical opinion (Article 12, Paragraph 1). The request may be made even after the expiration of the utility model right except when the registration has been invalidated in an invalidation trial. It takes about six months from the date of the request to obtain the technical opinion. The owner of a utility model right is entitled to one opportunity to correct the description, claim(s) or drawing(s), at any time except some prescribed cases (Article 14-2, Paragraph 1). The purpose of the correction is limited to (i) restriction of the scope of claims; (ii) correction of errors; (iii) clarification of an ambiguous statement; and (iv) conversion of dependent claims to independent claim format (Paragraph 2). Further, the owner of a utility model right may cancel claim(s) as many times as desired, at any time except in case the utility model right is challenged and after the notice of the conclusion of invalidation trial proceedings is issued (Paragraph 7). * Note: JPO uses the word “amendment” for amending description, claim(s), drawing(s) etc. before registration, and the word “correction” after registration.